There's this really neat series of blogs that have recently been brought to my attention called the Berry Go Round. You can read more about it in detail HERE, but in a nutshell it's a series of blog posts written by a whole bunch of different bloggers in science and nature. It's a very "non-sciency" approach to nature, and there are some very, very talented people that write about why nature (plants in particular) rocks. How did I not know about this before?! Every month a different blogger volunteers to create a blog post highlighting some interesting blog posts that they've read about a specific topic. This month's post is all about where nature and humans intersect, and how we often rely on nature and natural ecological processes more than we think. And GUESS WHAT?! I'm featured. Woo hoo! If you'd like to read this month's Berry Go Round post, you can do so HERE at my "Internet Friend" Tim Havenith's blog called Notes of Nature. As an aside, Tim is a pretty awesome blogger so you should browse his blog if you've got some time on your hands. The pictures he takes are also quite stunning. There are times I have some pretty severe pictographical jealousy. And last but not least, topic three! I stumbled across this really, REALLY unusual news story on Twitter last month, and I sat there shaking my head at the absurdity of it. I've mentioned this place before in my blog, but there's a really amazing botanical garden in England known as the Royal Botanical Garden Kew (or, in plain English just Kew). They have probably the biggest greenhouse and botanical garden complex in the world (I don't know that for a fact but boy...it seems big! ), and they have some spectacular plant displays from gigantic water lilies (which I blogged about HERE) to teeny tiny orchids and everything inbetween. One of their glasshouses (or greenhouses, as us North Americans like to call them) was built before most of the houses in the entire city I live in. It's crazy a bunch of glass can last that long! 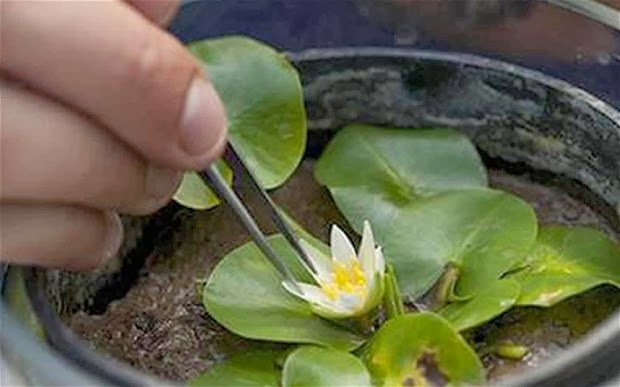 Two weeks ago the world's smallest lily was stolen from Kew. That's right, a plant was stolen. The plant is special not only because it's the world's smallest lily, but also because it is critically endangered; it is known now only from "captivity" since it went extinct in the wild (it's native range is a very, very small area in Rwanda) about six years ago. The botanists at Kew finally managed to recreate the environmental conditions required for the plant to flourish, and have managed to grow 50 plants from seed. And then someone stole the parent plant. Stole it! Right out from under the noses of Kew's staff, in the middle of the day. So if you think only animal poaching exists, think again. Plant poaching is alive and well, unfortunately. The best part about all of this is that the plant will almost certainly die since its captors don't know the exact environmental conditions required for the plant to flourish. This case is being taken so seriously in England that the Metropolitan police are on the case and are prepared to prosecute the thieves to the highest degree possible. And since this plant was on international "thou shalt not possess" treaties...the penalties may be incredibly steep. So if you hear of someone trying to pawn off a half-dead miniature lily on Craigslist, let Kew or the Met police know. Stop stealing critically endangered plants, people! They're there to look at, not to take at your leisure. If you'd like to read the news story, you can do so on the Telegraph site HERE.